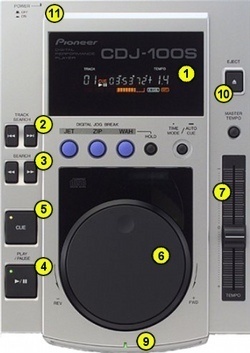 Despite the fact that professional CD players already existed back in the 90s, the club standard – Pioneer CDJ-1000 – emerged only after the deck was introduced in 2001. The long absence of such a standard led to different manufacturers taking different approaches to implementing some of the features in their DJ CD decks. Thus in this article, I will only talk about the common denominator, or “CDJ mode,” which is applicable to most modern DJ players. Details on a particular model can be gathered from its manual and hands-on experimentation. Take a look at the CD players below. The first one is the Denon DN-D4500 twin CD deck, and the second one is the Pioneer CDJ-100. I have deliberately chosen these older players for this article so as not to distract you with the myriad of extra controls available on newer and more advanced models. Other info such as the track’s BPM, its waveform, etc. Track search/skip buttons: Allow you to navigate the tracks on a CD. Search buttons: Allow you to fast-forward or rewind to a desired track position. Play/pause button: Pressing this button starts the playback. Pressing it again will pause the player and bring it into the “stutter” mode. This mode makes precise frame-by-frame search possible. Cue button: While in the “stutter” mode, saves the current track position (cue point) in the deck’s memory. Pressing this button during playback takes you back to the previously set cue point and pauses the deck. Jog wheel: When a track is playing, nudging the jog speeds it up or slows it down a little, which can be used to bring the track in sync with another one. In the “stutter” mode, the jog allows you to move frame by frame (a frame is 1/75th of a second) through the song. Pitch control: Just like on a vinyl turntable, the pitch control makes it possible to adjust the track’s playback speed. In a lot of today’s decks, the range of the pitch control is switchable and can be set to +/- 6%, +/-8% or even as much as +/- 100%. There’s a scale below the pitch slider so you can keep track of its position. The current pitch value is also shown on the deck’s display. Pitch bend: Quickly pressing one of these buttons will speed up or slow down the track for a fraction of a moment. This makes it possible for you to bring the track’s beats back in sync with another tune, just like nudging the jog wheel does. Tray or disc slot: This is where you put in a CD. Eject button: Pressing this button will eject the CD from the player. On/off button: Do I really need to explain this one? 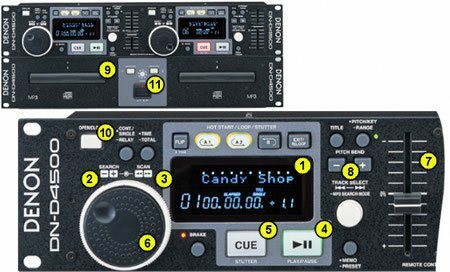 As you can see, there are still a few controls I skipped, and there are even more of them on the CDJ-1000 and other advanced decks. However, the controls listed above are the ones that are used most frequently in real life, and so a good understanding of them is more than enough to succeed in spinning CDs. where can i buy jog wheel part? I really struggle to mix with cdjs. 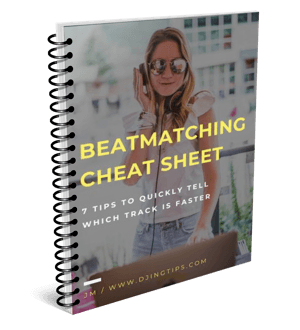 Hi, beatmatching and synching BPM is one and the same. There are really no shortcuts, you just have to practice. Here’s my beatmatching tutorial to get you started! A good article covering the basics on DJing..